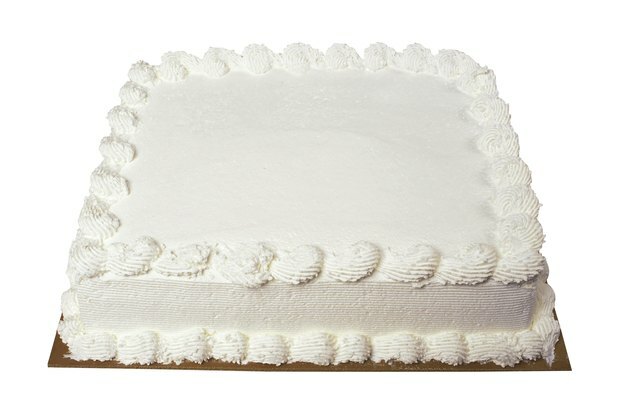 Baked goods, such as sheet cakes, can be notoriously high in calories. Sheet cakes are typically covered in large amounts of frosting, which is essentially a mix of fat and sugar, two things you need to limit in a healthy diet. Eating a smaller portion or making the cake yourself using a lower-calorie recipe can help you fit sheet cakes into a your diet occasionally. A small 2- by 2-inch slice of frosted sheet cake ranges in calories from 175 to 270, depending on the recipe used. One of the easiest ways to reduce the calories in your slice of cake is to change the topping. A tablespoon of creamy chocolate frosting has about 82 calories. If you skip the frosting and top your slice of cake with a tablespoon of whipped cream topping instead, you'll save 74 calories. Adding a teaspoon of powdered sugar to a slice of unfrosted chocolate cake only increases the calories by 12. Other options for reducing the calories include replacing up to half of the butter or oil in your favorite cake recipe with applesauce or mashed banana and decreasing the sugar by one-third to one-half.